Food is an essential element of Chinese New Year, with many families investing great time and effort to prepare and serve traditional dishes. The New Year is meant to mark new beginnings, so it’s important to many Chinese that they eat foods considered to be auspicious.  From meat and sweet treats to salads and fruit, these are some of the foods widely believed to bring prosperity, wealth, good luck and longevity. Yee sang is a uniquely Malaysian-Singaporean salad served cold and enjoyed before the Chinese family gathers for a reunion dinner. These days it’s considered lucky to have this salad with colleagues and friends – regardless of their ethnic background – all ethnic groups to bring prosperity to the workplace, school or foster closer friendships. In 2014, CNN listed yee sang – also known as yu sheng – as one of the world’s seven “fiercest food feuds” because it is claimed by both Malaysia and Singapore. So what are the dish’s origins? Probably based on a type of raw fish dish eaten in coastal parts of China, its modern form can be traced to a man in the town of Seremban, in Negeri Sembilan, Malaysia. According to the book A Toss of Yee Sang, a Chinese immigrant named Loke Ching Fatt and his family had a restaurant business that was going through tough times after the Japanese occupation of Malaya during World War II. Faced with the closure of his business, he came up with a fun dish, originally with 30 ingredients, topped with slices of raw fish and mixed with a sweet and tangy sauce made up of vegetable oil, sesame oil and honey. The vegetables including turnip, cabbage and carrots, and to add texture to the salad he threw in raw pomelo, peanuts and fried batter bits. 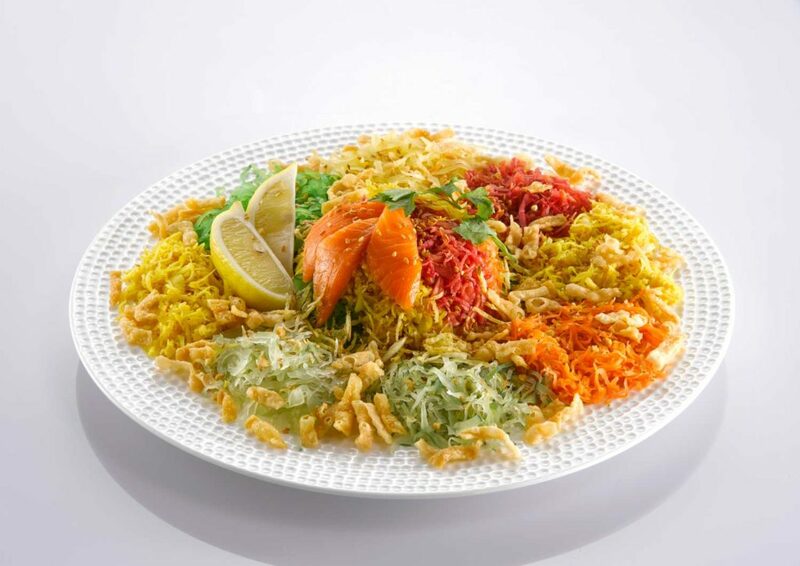 The name yee sang loosely translates to “fish” and “life”. Fish is a symbol of abundance, while life points to youthfulness and vitality. From these humble beginnings, yee sang has become a dining ritual in the month or so leading up to Chinese New Year. Everyone sits around the table with their chopsticks and tosses the ingredients as high as they can while shouting good wishes to each other. 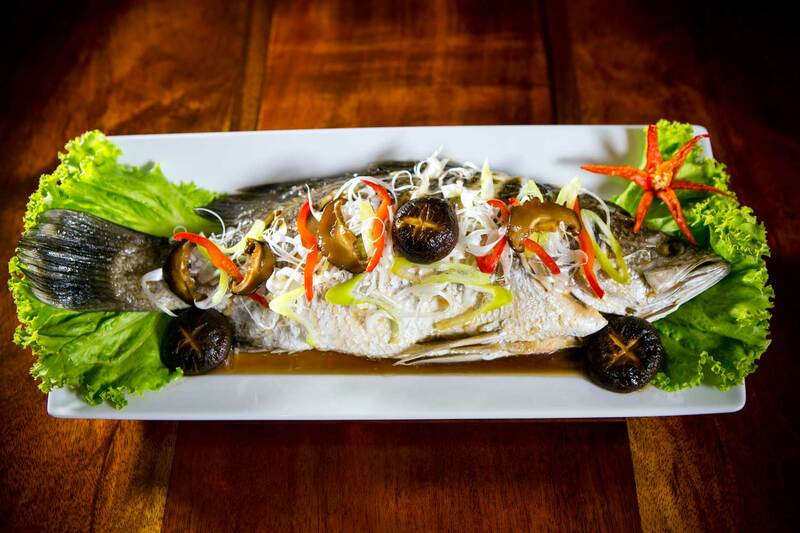 Fish is a must-have dish during Chinese New Year. Fish, pronounced “yu”, is also a homophone in Mandarin that means surplus. By having fish at the table, the Chinese family wants to invite this healthy surplus and ensure they enjoy it throughout the year. It could be linked to wealth and good health, even healthy relationships and offspring. “Yu” is present in two common sayings: “May you always have more than you need” (nian nian you yu) and “Success in exams” (yu yue long men or, “A fish leaps over the dragon gate”). Fresh fish is prized and steaming is the most popular preparation method. There are also a few rules to observe when serving it. The head of the fish should be placed facing the elders at the table. The fish should not be flipped after one side has been eaten. Typically, the backbone is removed as flipping the fish to the other side is considered to bring bad luck. Synonymous with many Asian cultures, dumplings are popular all year round and are packed with 2,000 years of history. Those eaten at Chinese New Year are made in a shape of Chinese gold and silver ingots: a boat-like shape turned up at two ends. There should be an even number of pleats on each dumpling. Each region in China has their own interpretation of dumplings, but they are mostly steamed or pan-fried. The filling is usually savoury, made with minced pork or shrimp and bits of vegetables mixed in. It is believed that the more dumplings you consume, the more prosperous you will be. 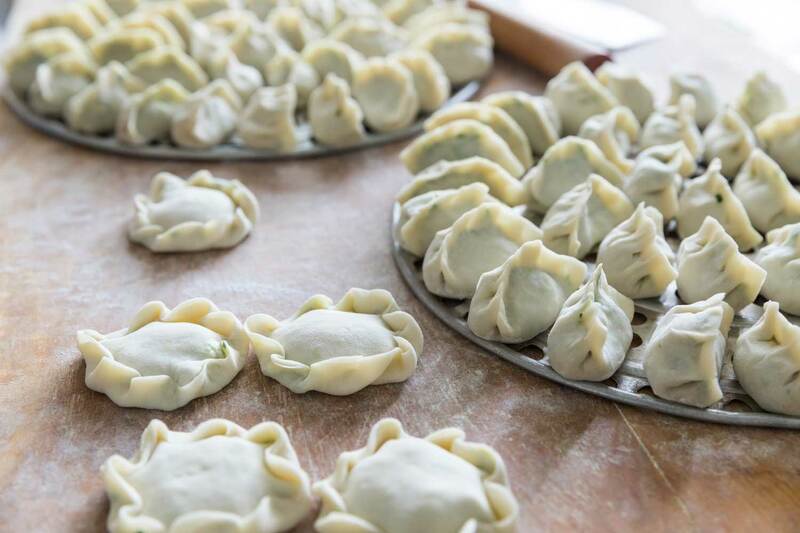 A couple of days before Chinese New Year, some families gather to prepare dumplings, fostering stronger familial ties. 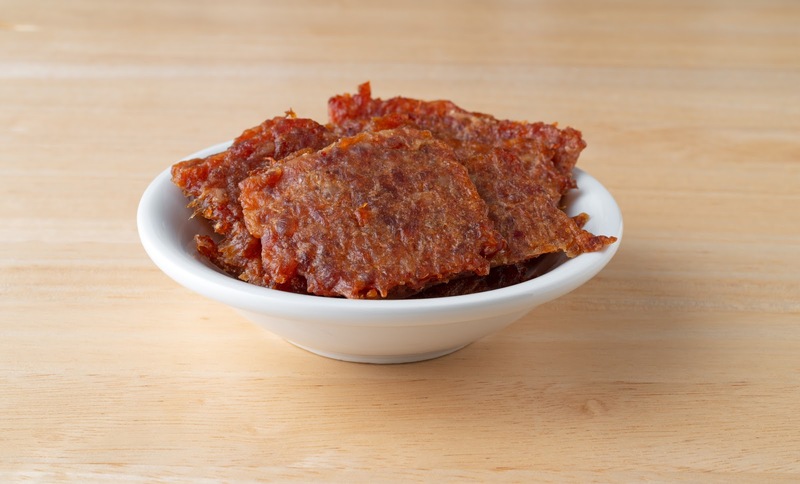 Bak kwa or barbecued pork jerky is very popular. While some shops have a steady supply throughout the year, many people only eat it at Chinese New Year. You can have them in square slices or small chunks. Some inventive bakers also use bak kwa to create unique cookies. This treat has recently taken a trendy twist with the availability of bak kwa seasoned with durian, pineapple and even coffee. If pork is not for you, there are other meats, such as chicken, lobster and beef, to choose from. Since red is the colour of the season, bak kwa’s deep red colouring is considered auspicious, bringing good luck. These days, vegetarians can also try dragonfruit bak kwa as a meat-free option. Nian gao, which literally means “year cake”, is made from glutinous rice, sugar, Chinese dates and chestnuts. 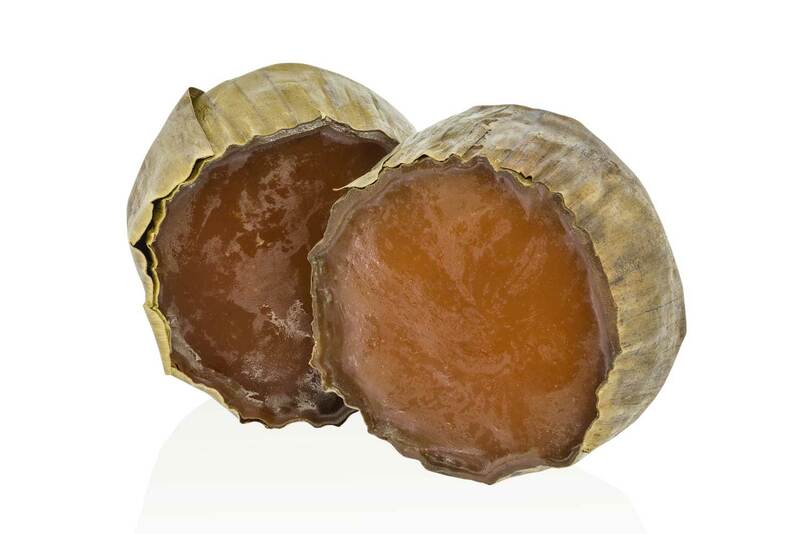 It’s round in shape and steamed for long hours in individual lotus leaf wrappings. To eat it, you need to steam it until it has a soft and gooey consistency. You can cut it into smaller pieces and eat them with shredded coconut. You can also sandwich a piece of nian gao between slices of sweet potato and yam and deep fry it. Aside from signifying the start of a new year, nian gao means “getting higher every year” – improvements in life, business and even literal growth. 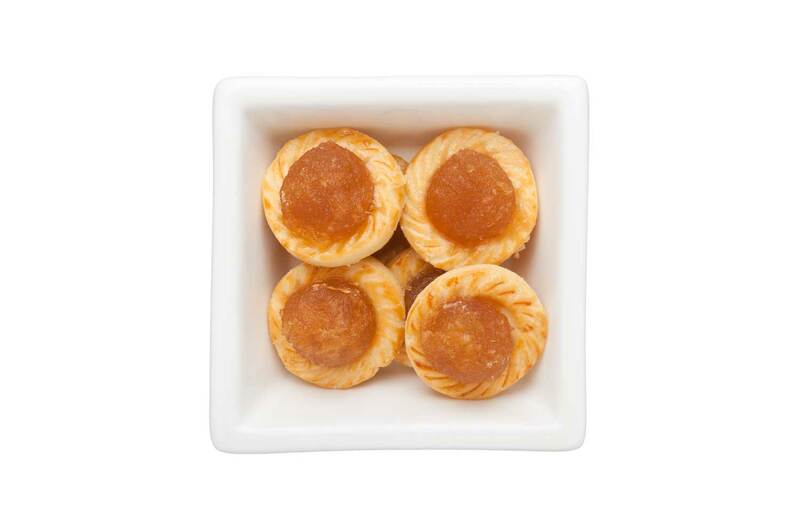 There’s no doubt pineapple tarts are delicious – the buttery pastry goes so well with the pineapple that has been cooked down with sugar. But this labour-intensive confectionery is particularly great to have during New Year celebrations as the Hokkien pronunciation of pineapple, “wong lai”, sounds like “prosperity is coming”. For this reason, Chinese families also like to display pineapple fruit at this time of year. 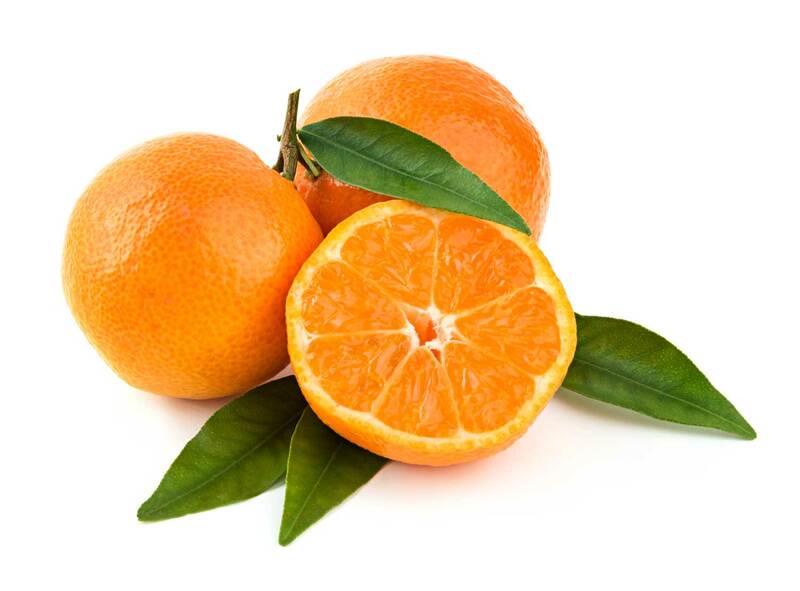 Mandarin oranges are another must-have treat in Chinese homes during the New Year, when they are displayed, eaten or presented to guests. Its Cantonese name, “kum”, is a homophone of gold and so they are believed to bring an abundance of wealth and prosperity. Meanwhile, its Mandarin pronunciation points to “success” and “luck”. Pomelos are popular, too, and for similar reasons. The Chinese word for pomelo sounds like “to have”, so including the fruit in New Year celebrations symbolises that you will be able to meet your ambitions in the year ahead. 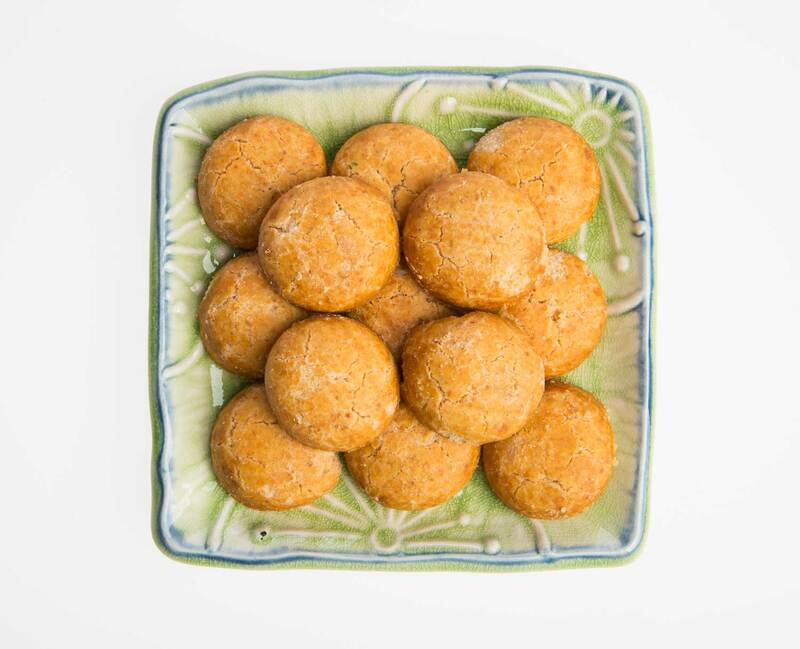 Another treat you will likely find in most Chinese households at Chinese New Year is the peanut cookie.  The humble peanut symbolises longevity and fertility. Fertility is always a popular topic during family gatherings – so much so that it has become a sort of running joke. Auspicious sounding snacks and cookies are often presented in a pentagon-shaped platter with eight compartments. This is known as the tray of togetherness. Apart from peanut cookies and pineapple tarts, you’ll typically find red melon seeds, soft candy, dried dates and more.